That thing up there? Word on the street (that is, Twitter) is that it's an engineering prototype of the Nokia Normandy, a low-end Android device due sometime in 2014. The name has been floating around for a few months now, often accompanied by images flaunting Nokia's usual design cues but without the hardware shutter button or LED flash that adorn its Lumia devices. Normally, that would peg the hardware for Nokia's Asha line, but rumors persist that the Normandy will actually be running a Nokia-tweaked version of Google's open-source OS. Screenshots leaked earlier this month also suggested that the device would support dual SIMs and showed off mockups with touchscreen notifications and a customized Skype app. Unfortunately, the leaked device doesn't do much to add or detract from that rumor, revealing only a generic back button, a Nokia boot screen and a rubberized case that obfuscates the handset's features. Still, something is clearly afoot; we'll let you know when we know what, exactly, it is. Update: A separate leaked image is doing the rounds, which purports to show the app drawer from Nokia's Android skin running on a live Normandy handset. 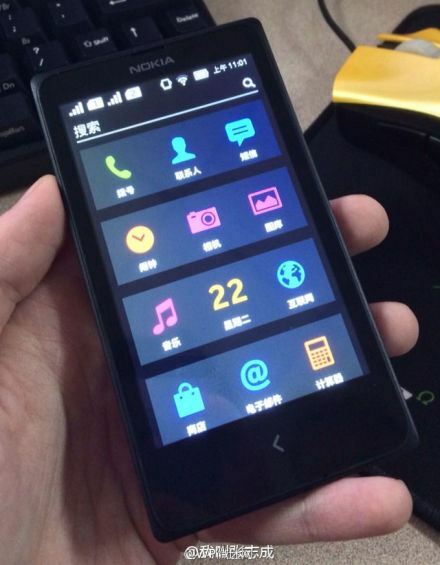 The source is Zhang Zhicheng, a blogger at a well-known Chinese tech site, but the skin seems to be lacking Nokia's usual gloss -- check it out below.